Eating healthy foods is extremely important during pregnancy. Thus, expectant mothers need to lay special emphasis on their diet so that they can include a variety of nutrients such as vitamin A, vitamin C, vitamin D, folic acid, iron, calcium, and so on. The best way to get a variety of vitamins and minerals in your diet is to have healthy meals. In addition, food cravings between meals can be satiated by having different types of snacks prepared from fruits, vegetables, nuts, and whole grains instead of resorting to junk food. These snacks also serve as mini-meals which are often recommended during pregnancy because it is better to eat several small meals throughout the day instead of having two or three heavy meals. Yogurt: Dairy products are highly beneficial for moms-to-be because they are rich in calcium which, in turn, is good for the development of the skeletal structure of your baby. 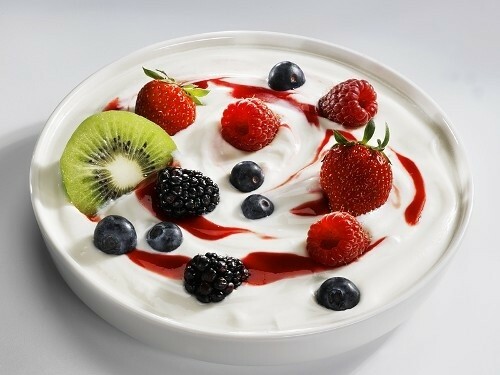 Yogurt is also loaded with protein and B vitamins. Plus, it aids in digestion and helps prevent yeast infections during pregnancy. You can make this pregnancy snack healthier by opting for low-fat yogurt and add nuts, fruits, seeds, brewer’s yeast, or a high fiber breakfast cereal in it. Salads: Expectant mothers can have healthy salads with light dressings. In the salad, you can include foods like cabbage, lettuce, collard greens, chickpeas, tuna, kidney beans, green peas, beets, asparagus, tomato, cucumber, bell peppers, steamed broccoli, spinach, sweet corn, sweet potatoes, cottage cheese, sprouts, sesame seeds, flax seeds, sunflower seeds, and numerous other ingredients. Carrots: This is a simple yet crunchy and delicious snack that is safe to eat during pregnancy. It is a healthy food that also relieves stress and fatigue. You can opt for carrot sticks dipped in guacamole, too. Do not snack on carrots in excess, though. Whole Grain Crackers and Peanut Butter: This is a fiber and nutrient-rich snack. It makes you feel fuller for longer. Moreover, peanut butter is a good source of protein and monounsaturated fats. You can also go for cheese crackers (avoid soft cheese, though). Nuts: Munch on nuts like almonds (rich in vitamin E, polyphenols), walnuts (provide omega-3 fats and good for your baby’s eye and brain development), cashews (minerals like phosphorus, iron, magnesium, selenium), etc. to derive vital vitamins and nutrients through snacking. However, make sure you eat these nuts in moderation. Roasted Red Pepper Hummus: You can have red pepper strips with red pepper hummus spread prepared from chickpeas, tahini, roasted red peppers, lemon juice, garlic, cumin, cayenne pepper and olive oil. Besides, you can snack on soy chips, celery sticks, sandwiches prepared from whole-wheat bread, hard boiled eggs, baked tortilla chips with cheese, vegetable soups, smoothies, milkshakes, ginger tea, skimmed milk spiced with cardamom, whole-grain pretzels, dried fruits, popcorns, trail mix, and so on. Moreover, you can munch on granola bars, whether you are at home or at work. Plus, make sure you eat fresh fruits like apples, bananas, oranges, pears, strawberries, blueberries, watermelons, pomegranates, etc. Apart from taking these healthy snacks, try to take adequate precautions in terms of diet, health as well as lifestyle. For instance, avoid taking caffeine in excess because it is a diuretic and mild stimulant. Though not proven completely still, it is believed that taking high levels of caffeine during pregnancy tends to increase the risk of low birth weight of the baby.